The sales trend, however, indicates that the UK is on the way to a music streaming economy – as the US market, a fact I have highlighted in an earlier blog post. 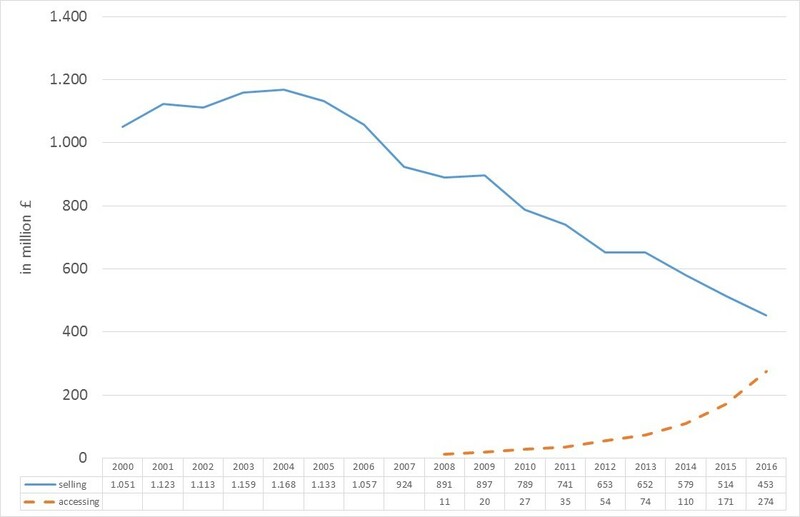 In the following long-term analysis of the UK recorded music market I am highlighting not just the recent recovery of UK’s recorded music sales in the past few years, but also the seemingly irresistible boom of the recorded music market since the mid-1970s and the tremendous sales decline in the 2000s. In a long-term perspective, the UK recorded music market (excl. 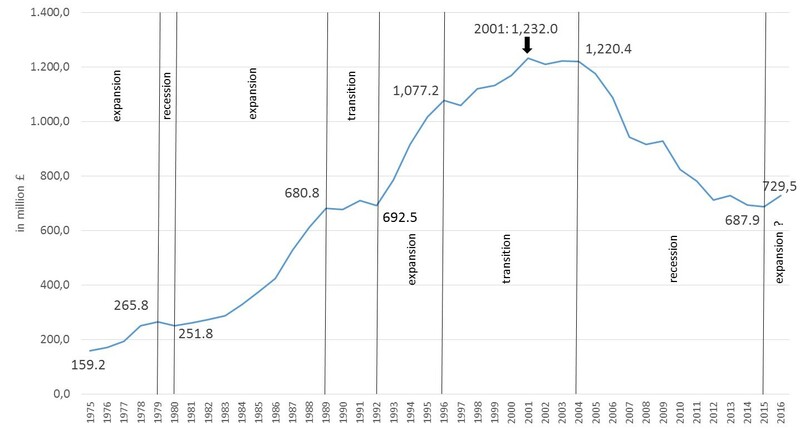 performance rights and synchronisation revenue) went through a business cycle with (1) an expansion period from 1975 to 1979, (2) a short recession in 1980, (3) a sales boom from 1981 to 1989, (4) a transition period in the early 1990s, (5) a second sales boom from 1993 to 1996, (6) a further transition period (1997-2003), before (7) the sales decline accelerated in the mid-2000s. Digital sales have eased the decline since 2008, which seems to come to an end in 2016. However, the UK recorded music market has lost almost 41 percent (£500m) of its volume since it peaked in 2001. Source: After BPI annual reports, 1975-2016. What drives the business cycle? A closer look at the figures reveal different factors. The expansion period in the second half of the 1970s was shaped by the disco music boom, but also by the advent of Sony’s walkman and music television (MTV). After ABBA had topped the New Music Express (NME) charts of 1976 with “Mamma Mia” (2 weeks at #1), “Fernando” (6 weeks at #1) and Dancing Queen (5 weeks at #1), the disco wave over-flooded the UK with number hits by Donna Summer (“I Feel Love”), Boney M (“Ma Baker”) and Baccara (“Yes Sir, I Can Boogie”) in 1977. The disco genre reigned the following two years with hits from the musical films “Grease” and “Saturday Nights Fever”. Despite a few further ABBA hits, the disco craze came to an end latest tin 1981. In 1979 Sony had introduced the walkman on the market and fuelled the boom of the music cassette (MC). The MC album sales quintupled to £252m within 10 years, after vinyl album sales had peaked at £163m at the height of the disco craze in 1978. In 1986, more MC albums (trade value of £152m) were sold than vinyl albums (trade value of £141m). With the rise of the CD, which Sony and Philips had introduced on the UK market in 1983, vinyl sales dramatically declined and vinyl became a niche product for record collectors. The short recession of the UK recorded music market in 1980, thus, was mainly caused by format change from vinyl to the MC with the second oil crisis as economic background, but was not a result of music “piracy” by home taping of radio music broadcasts as the music industry bodies claimed – remember BPI’s copyright infringement slogan of the early 1980s “Home Taping Is Killing Music”. The CD along with the launch of MTV (1981) and a strategic shift by the major record companies from music market segmentation of the 1970s to superstar pop of the 1980s fuelled the recorded music sales boom of the early 1990s after a further transformation from the MC to the CD format. However, the annual growth rates for total recorded music sales from 1993 to 2000 were lower with an annual average of 6.9 per cent than from 1983 to 1990 with 12.3 percent. 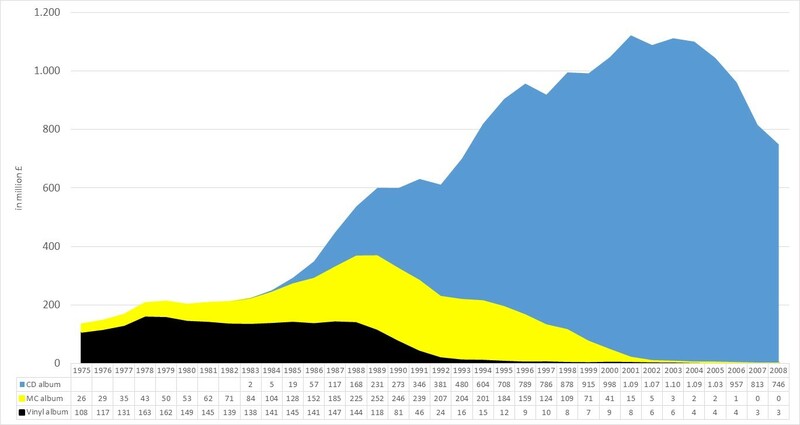 While MC and CD sales were increasing at the same time in the 1980s, the CD was the only growing market segment in the 1990s. In 1990, CD album sales (£273m) outperformed for the first time MC album sales (£246m). Whereas the CD sales climbed to almost £1bn in 2000, the MC fell into irrelevance in the same period. Source: After BPI annual reports, 1975-2016; the BPI did not report separate figures for CD, vinyl and MC sales after 2008. However, the CD format came to the last period of its product life cycle by the millenium. Nevertheless the UK CD sales remained at a very high level and peaked with £1,103m in 2003 despite the launch of Napster and other P2P file sharing services. The recession hit the UK recorded music market not until 2005, but then the decline accelerated. Again the format change from the CD to digital download sales caused the sales slump. The boom of the digital music sales, however, was not a homogeneous and linear process. Initially ringtones’ and ringback-tones’ sales fuelled the market, before music downloading became the main digital revenue stream. 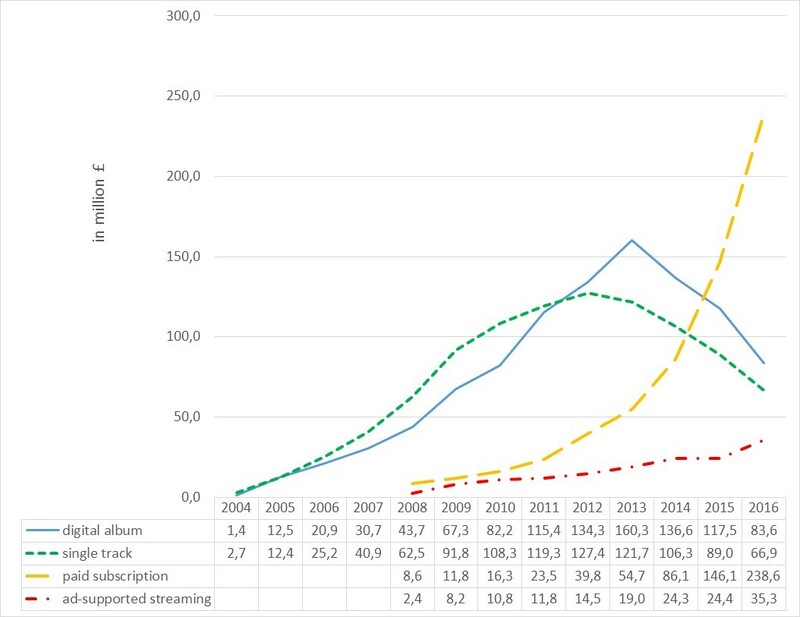 Single track sales increased from almost nothing in 2004 to a historical height of £127m in 2012. A year later digital album sales peaked at £160m. However, with the music streaming boom download sales dramatically declined in the past few years. While combined revenues from paid and ad-supported streaming (incl. music video streaming on e.g. YouTube) have climbed up to £274m in 2016, download sales (single track and album) decreased to £150m. Thus, the music download market-share of 84.4% in 2010 has shrunk to 34.9% in 2016. At the same time the music streaming market-share exploded from 12.0% to 63.6%. Source: After BPI annual reports, 2004-2016. Source: After BPI annual reports, 2010 and 2016. The massive growth of music streaming revenue, therefore, substantially increased overall UK recorded music sales in 2016. Gains of £103m in the music streaming segment, thus, compensated not just for the loss of £5.8m of physical sales, but also for the £56m decrease in download sales in a year-to-year comparison. There are, however, elements of uncertainty for a turnaround of the UK recorded music market. The expected decreases of CD album sales and physical video sales have to be modest in the next few years and should be accompanied by further boom of the vinyl sales. At same time the revenue growth from music streaming may not slow down as the music download segment further erodes. Nevertheless, the UK recorded music market is on the way to a music streaming economy. The revenue from music accessing (music streaming and cloud-based music services) is on the rise and will soon outperform revenues from music selling (physical and download music sales). Source: After BPI annual reports, 2000-2016. BPI, Annual reports 1976-2016, London. BPI, 2017, “UK record labels’ trade income at five-year high following 5.1% growth in 2016”, BPI press release of April 13, https://www.bpi.co.uk/media-centre/uk-record-labels-trade-income-at-five-year-high-following-51-growth-in-2016.aspx (accessed July 30, 2017). Music Business Research Blog, 2017, “The US recorded music market in a long-term perspective, 1990-2016”, May 5, 2017, https://musicbusinessresearch.wordpress.com/2017/05/05/3340/ (accessed July 30, 2017).